Embedded Projects for students is a computer controlled system and microprocessor system which programmed to perform various tasks. We develop embedded projects for college students with mixture of computer hardware and software. We develop more projects with real time based application and from IEEE papers. We support ECE students with undergraduate & postgraduate to develop projects in embedded domain. We adopt embedded system based projects for various specialized application. We provide various software tool to design embedded application in real time. Low cost & low power consumption. Embedded system program run under real time constraint with limited resources. Cell phone & phone switches. Home appliances as DVD player, air conditioner and video games. Network routers, fire walls and time servers. Computer peripherals such as disk driver, floppy controller and printer. We develop compile and run application program on host system. 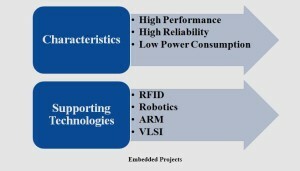 We proposed embedded program to target processor and drive under device or controls. We adopt native linker to perform task such as to locate embedded binary code into target processor. We generate host machine code on hard drive which load loader into RAM & schedule program to CPU. By loader we resolve address to call by native OS routines.Using loader we generate target machine code and combined code which are copied into target ROM. We determine machine code composed of locator glue into RTOS (real time operating system) and combined code referred as map. In RAM, we adopt application program or codes logical address to create function call. We organize logical address by linker. We used loader to amp logical address into physical address. We refer the mapping process in embedded system as address resolution. We provide ROM emulator to emulate target system on read only memory. It composed of ROM circuitry and serial or network interface too host system. By ROM emulator locator we load map into emulator for debugging process. For debugging process in embedded system we load flash memory with target map code by software on host over serial port or network connection. We described real time embedded system as subclass of embedded system with strict timing constraints. In real time system we specify the ability to create certain calculation or timing decision to face application deadline. Hard real time system is an guaranteed critical task which completed on time. It adopted to reduce delay happened in network and current task has high priority. We process soft real time system as critical real time task with high priority. We developed more than 90+ projects in embedded system with various techniques for ECE students in an efficient way.